SCFB Members 18-35 who have an interest in and knowledge of agricultural issues. For productive thinkers, problem solvers, motivational encouragers, agricultural enthusiasts. The SCFB YF&R Discussion Meet is an annual competitive leadership development opportunity for YF&R members who take interest in discussing pressing agricultural issues. The Discussion Meet recognizes individuals for their public speaking skills, group problem-solving abilities and knowledge of current agricultural issues. The competition is designed to simulate a committee meeting and/or the Farm Bureau policy development process where discussion and active participation are expected from each participant. Competitors are evaluated on their exchange of ideas and information on a pre-determined topic. Successful participants are productive thinkers and assist the group in creating ways to implement the solutions discussed and highlight Farm Bureau’s involvement in those actions/steps. All participants who do not advance to the Final Four will receive a $75 VISA gift card. Participants prepare thoughtful responses to questions that are provided in advance. On the day of the competition, participants take part in one round of discussion with 4-6 competitors before judges and an audience. Four participants will advance to the final round. Participants are judged on Problem Solving, Analysis of Topic, Cooperative Attitude, Delivery, Opening Statement and Closing Statement. The Discussion Meet is intended to simulate a committee meeting and building consensus and problem solving is very important to this competition. The winner and runner up will be determined by the judges after the final round. All competitors will be recognized during the Awards Program on Friday evening at the SCFB Annual Convention. The following resources are available for download and print, for those interested in preparing for and participating in the SCFB Discussion Meet. Please note that same questions and materials will be used for the 2019 AFBF Discussion Meet. 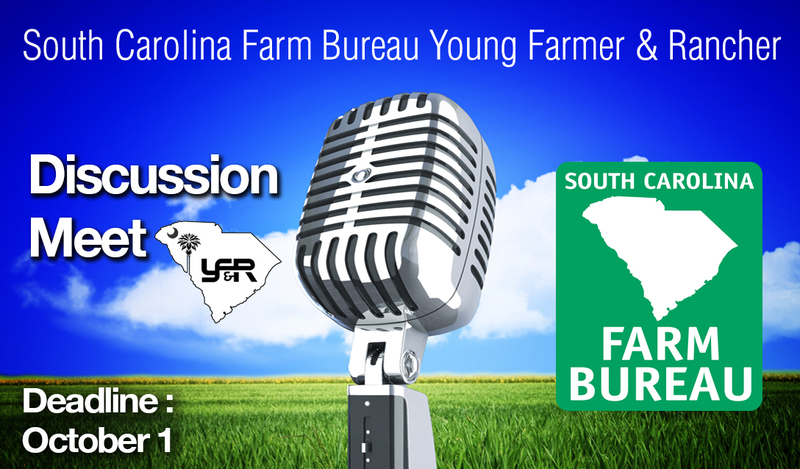 Discussion Meet prizes are sponsored in part by the SC Farm Bureau Federation and Southern Farm Bureau Life Insurance Company.